Today is Monday, June 4th, 2018. I’m Kevin Boyle, with today’s WVBI Community Calendar. That was Elsie and Olga Burton with Chris VantHof, all part of the B-I-C-S Drama class that produced the show. The performers also included Jessica LaFreniere, Micah Richards and Quitan De Laat. They directed some of the scenes themselves. Overall direction was from Jacque LaFraniere. Sound and lighting was by Ann Partridge and Island Treasures provided the costumes. At the library, 2018’s Summer Reading Program is underway. Libraries Rock is the theme. All kids, Pre k through 12th grade are invited to participate in this fun filled summer reading program. Stop by the Library to register and get started. There’ll be a Kick Off party June 11- a Sock Hop at the Library, 4-6 p.m. Music, Games, Crafts, and Food. Lots of fun, so drop by on the 11th and join the library as they celebrate the beginning of the Summer Reading Program. Also, if you have a musical instrument you can spare for the month, the library would like to borrow it for a display in our entry way cabinet of interesting and unusual instruments. Drop off at the library with your name and contact information attached! Thank you! Story Time at the Library on Mondays at 10:30. Tuesday, Arthritis Foundation Exercise Program here at the BIC Center at 10. Also, Tuesday, the Historical Society will hold a special meeting about the WaterWays exhibit they are hosting this summer. The meeting is at 5 at St. James Township Hall. Also on Tuesday, Island Treasures is shifting to summer hours. They’ll be open Tuesday through Saturday noon to 4. Wednesday, BINGO at Gregg Fellowship hall. Doors open 6:15 for fellowship and the games start at 7. Also on Wednesday, St. James Township holds regular monthly meetings of their Public Works Committee and the Township Board. Check their website for details and to download meeting info. The Arthritis Exercise Program is here at the BIC Center on Thursday at 10. Friday it’s Games Galore from 1 to 4, again here at the BIC Center. Another big weekend coming up. It’s graduation day for Katie LaFreniere and Forrest Avery-who are both enjoying their first post high-school Monday today. Graduation is at 1 here at the BIC Center with a reception to follow out at the Golf Course from 2 to 5. Also this weekend, two movies here at the BIC Center. Early Man is at 3. Set at the dawn of time, when prehistoric creatures and woolly mammoths roamed the earth, Early Man tells the story of Dug, along with sidekick Hognob as they unite his tribe against a mighty enemy Lord Nooth and his Bronze Age City to save their home. It’s from the folks who brought you Wallace and Grommit-so very cool clay stop motion animation and hilarious. At 7, its’s a Wrinkle in Time-a great family movie about a girl searching for her scientist father across space and time. TODAY: A 30 percent chance of showers, mainly after 5pm. Increasing clouds, with a high near 66. West wind around 15 mph, with gusts as high as 30 mph. TONIGHT: A 30 percent chance of showers before 8pm. Mostly cloudy, with a low around 43. Northwest wind 10 to 15 mph, with gusts as high as 25 mph. TUESDAY: Mostly cloudy, then gradually becoming sunny, with a high near 61. Northwest wind around 10 mph. WEDNESDAY: Mostly sunny, with a high near 64. Calm wind becoming southwest around 5 mph in the afternoon. TODAY: W wind 10 to 15 kt. Partly sunny. Waves around 2 ft.
TONIGHT: NW wind 10 to 15 kt. Mostly cloudy. Waves around 2 ft.
TUESDAY: NW wind around 10 kt. Mostly sunny. Waves 1 to 2 ft. Conditions at 8 this morning: 51 degrees at the BIC Center with light breezes out of the East. It was cool overnight with a low of 48. Rain stopped about 1:30. Humidity 85% and the pressure was 29.48 and rising slowly. Dew point 48. Around the island it was 53 at Whiskey Point, 50 at McCauley’s Point, 49 on Greene’s Bay, 52 down at Lake G and at the W-V-B-I transmitter site it was 52 with clear skies. Looking out on Paradise Bay, the Hodgson Enterprises Webcam showed Paradise Bay looking almost like a mirror this morning, with a nice sunrise coming up through some clouds on the horizon. 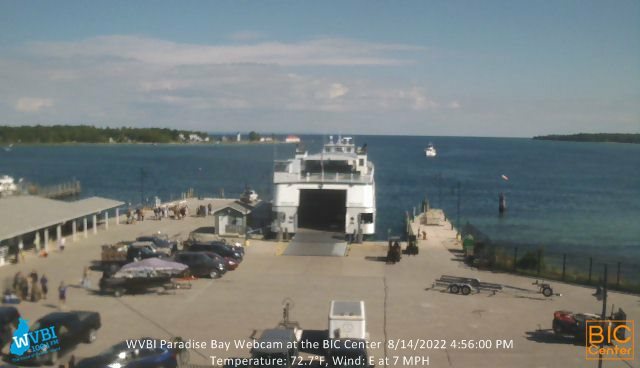 You can see what’s going on now by going to w-v-b-I dot net and scrolling down to see the webcam at the bottom. POLLEN REPORT: Medium levels today at 5.3, mulberry, Oak and grasses being the leaders just like Friday. ON THIS DATE of June 4, 1919, The 19th Amendment to the U.S. Constitution, guaranteeing women the right to vote, is passed by Congress and sent to the states for ratification. Stop and think about that date. It is not quite 100 years ago. Efforts to give women the vote went back to at least the time of the civil war, but they didn’t gain mush traction until after the turn of the century. In 1913, the National Woman’s party organized the voting power of women to elect congressional representatives who supported woman suffrage, and by 1916 both the Democratic and Republican parties openly endorsed female enfranchisement. In 1919, the 19th Amendment, passed both houses of Congress and was sent to the states for ratification. On August 18, 1920, Tennessee became the 36th state to ratify the amendment, giving it the two-thirds majority of state ratification necessary to make it the law of the land. Eight days later, the 19th Amendment took effect. You can read more about it in Phyllis’ Facebook post for today. Phyllis asks: DID YOU KNOW THAT the Detroit Zoo was the first zoo in America to feature cageless, open-exhibits that allowed the animals more freedom to roam. WORD OF THE DAY: atavism (AT-uh-viz-uhm) which means a reversion to an earlier type; throwback. The Latin noun behind the English noun atavism is atavus “great-great-great grandfather; ancestor.” Atavus is formed from atta “daddy,” a nursery word widespread in Indo-European languages. The second element, avus “(maternal) grandfather,” also has cognates in other Indo-European languages, including those Scottish and Irish surnames beginning with ” O’,” e.g., O’Connor “descended from Connor”). The Celtic ” O’ ” comes from Irish ó “grandson,” from early Irish appearing as “descendant of”. Atavism entered English in the 19th century. TRAFFIC: The island beltway is running smoothly with no bridge delays, and no delays inbound or outbound form either of the airports. But, let’s be careful out there especially traveling up and down east and west side drives and double-especially in the school zone. Here’s a thought for our B-I-C-S seniors: Graduation is only a concept. In real life every day you graduate. Graduation is a process that goes on until the last day of your life. If you can grasp that, you’ll make a difference. On a lighter note: What did the grumpy person eat on their birthday? That’s the WVBI Community Calendar for Monday, June 4th, 2018. I’m Kevin Boyle at WVBI’ the Voice of Beaver Island wishing you a great week-end and asking you on behalf of Greg Doig to, why not, make today the best day ever. And, thanks for listening.